On a cold day in late 1978, the German vessel München set off across the North Atlantic from Rotterdam, Netherlands, bound for Savannah, Ga. On Dec. 7, the tanker, which was the length of two and a half soccer fields and touted as unsinkable, vanished with but one garbled distress signal. Despite the most massive search ever for a ship, all that was found were the tattered remains of a lifeboat that had been anchored 30 meters above the ships water line. The disappearance was ruled a freak act of weather, likely from a giant storm wave. New satellite observations, however, suggest that these giant waves might not be such aberrations. 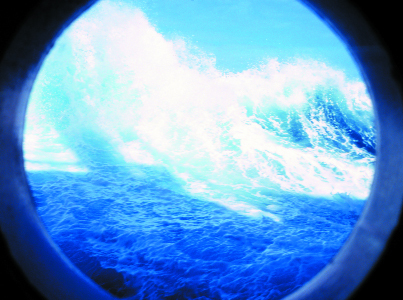 Waves break outside a porthole on the National Science Foundations Nathaniel B. Palmer, as it traverses the Southern Ocean. For centuries, sailors have reported giant walls of water rising up out of nowhere, and for the first time, satellite observations are confirming the existence of such rogue waves. Image courtesy of Michael Van Woert, NOAA Photo Library. Since sailors have been riding the seas, they have reported walls of water rising up out of a calm sea, says Paul Liu, an oceanographer with the National Oceanic and Atmospheric Administration. Scientists operating under the traditional wave concept, however, have long dismissed such accounts as implausible, he says. But in the past decade alone, there have been many harrowing tales of encounters with rogue waves  defined as individual waves of exceptional height or abnormal shape that are more than twice the average of the highest one-third of all the wave heights in a given wave record. The Queen Elizabeth 2 passenger ship met a 29-meter-high wall of water in the North Atlantic in February 1995. Within one week in February and March 2001, the Bremen and Caledonian Star, two cruise ships that travel to Antarctica, encountered 30-meter-high rogue waves that smashed in bridge windows and nearly sunk the Bremen in the South Atlantic. Although these ships survived to tell the tale, an average of four ships sink every week, says Tim Roxby of Lloyds Marine Intelligence Unit in England. Last year, 211 vessels disappeared, 24 of them more than 100 meters long. Some scientists believe that the many ship sinkings are related to rogue wave encounters during storms. For the past few years, researchers with MaxWave, a European Union-sponsored project organized to study rogue waves, have been using European Space Agency images from synthetic aperture radar satellites to learn more about ocean processes, especially at night and during storms when normal satellite images would be obscured by darkness or clouds. The results from the more than 1,000 radar images  5 kilometers by 10 kilometers each and collected over a three-week time period  were surprising, says Susanne Lehner, an oceanographer with the University of Miami in Florida who has been involved in the MaxWave project. The images revealed 10 individual rogue waves that were more than 25 meters high. According to the traditional linear wave models, such large waves should occur once every 10,000 years, Lehner says. Even in the midst of a storm, hypothetically, waves should not exceed 15 meters, Liu says, which is why large ships are built to withstand waves of up to that height. In analyzing the radar images, Lehner says, the scientists have been able to determine that rogue waves tend to occur in places where waves of differing strengths come together from different directions. Prime examples include when waves travel against a current and are focused in one area, such as around the southern tip of Africa or in the open ocean where a fast-moving storm travels over already-existing waves, she says. Most of the rogue waves the satellites imaged were in southern oceans in winter, but radar images taken from oil rigs in the North Sea have also recorded many rogue waves. What the researchers have found, Lehner says, is that rogue waves can happen anywhere. Looking at storm patterns can hopefully help predict where ships might be likely to encounter such waves, she says. Although we talk of rogue waves, the nature of the ocean environment is such that we should expect frighteningly high waves and steep walls of water to occur, says Nigel Barltrop, chair of naval architecture and ocean engineering at the University of Glasgow. Barltrop has been working for several years on methods to predict the nature of rogue waves and the effect they have on ships and offshore floating platforms. He has created extreme events in large wave tanks and measured the effects on supertanker models. Although we probably cannot limit the number of encounters with rogue waves, we should be able to make ships more tolerant of extreme events, Barltrop says, through better initial ship design and more sensible selection of construction materials. Most losses of ships and lives, He says, are the result of a combination of an extreme event with inadequate design or maintenance  things that can be fixed. Updating shipbuilding codes is part of the MaxWave program. The other part  observing the oceans and learning to predict rogue wave events  is already providing intriguing results, Liu says. The next step, he says, will be continuous monitoring of the oceans, rather than snapshots; the Europeans have already begun continuous monitoring with the ENVISAT satellite, Lehner says.